Without a hint of a shadow of a doubt, the world's most elegant drink is the Margarita, and no matter how travel-weary, how foot-sore, how sledge-hammer jet-lagged, my relentess search for the perfect Margarita goes on. It's not just the intriguing pale green liqueur, it's the ineffable ritual of the thing: the lime juice, the triple sec, the frozen-or-on-the-rocks, the are you completely familiar with our range of Tequilas, Sir? Is that with salt or without? But where did that last question come from? Of course I want it with salt. That's why I ordered a Margarita and not a pint of lager. I'd also like it with Tequila, just in case you are wondering. 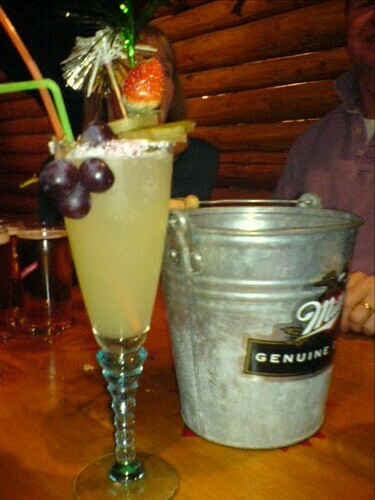 The Margarita in the picture was from the Bar Canadien, Les Gets, France. It didn't come with salt, subtled around the rim of the glass with a smear of lime juice. It came with dessicated coconut, slimed on a coating of strawberry jam. It wasn't the perfect Margarita. But it still had magic. The immutable, golden rule of Margaritas is that in any bar, in any part of the world: if they serve a Margarita at all then a Margarita is the most sophisticated drink that they serve. Rest assured: the monkey-nut sprinkled Bar Canadien in Les Gets, France is no exception to this rule.